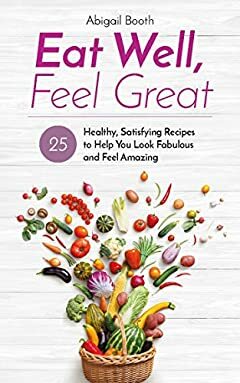 Eat Well, Feel Great is the healthy cookbook for busy women. This wholefoods cookbook will show you that delicious and nutritious food doesnâ€™t have to be boring, bland or complicated. That to look and feel great you donâ€™t have to starve yourself or use willpower to get there. You can eat healthy satisfying recipes made of real food and still lose weight and have loads more energy. Of course it isnâ€™t easy to juggle the demands of a career, family, home and social life (if youâ€™re lucky!) and then put a freshly cooked meal on the table each night. With a bit of organisation and these healthy easy recipes for dinner you can embrace a more balanced diet and lifestyle as well as cooking foods that all the family will enjoy. Abby is not only a health coach but a great cook. Â Spending time on each recipe to help her clientâ€™s needs including myself. Â She has definitely thought about what everyone needs to lead a healthy and happy lifestyle, creating recipes that all the family can enjoy. Â Including my particular picky eaters. Delicious and tasty, making you come back for more. I first tried Abbyâ€™s recipes as part of a sugar free challenge that she ran over 8 months ago. Â In the last 8 months, Abbyâ€™s recipes have become the â€œgo-toâ€ choice for me when looking for healthy, tasty inspiration. Â They are exactly the kind of food that I enjoy, but healthier. Â The recipes are all easy to understand, with simple instructions and ingredients that can often be found in the store cupboard. Â I am not the most confident cook, but have found all of Abbyâ€™s recipes easy to make and even get approval from my hard-to-please chef husband. Â I cook at least one or two of Abbyâ€™s recipes every week, and a couple have become family favourites. By experimenting and expanding your repertoire, as well as the ingredients you stock in your kitchen, you leave little room for the rushed convenient choices which are easily made when you havenâ€™t the time, energy or willpower to think! Remember, long term healthy living doesnâ€™t have to be difficult or complicated â€“ you can eat well and feel great through delicious, real and filling foods â€“ go on give it a try!